• The economy is soaring, giving consumers the extra confidence they need to increase shopping this season. According to a recent NRF survey, consumers say they will spend an average of $1,007.24 this holiday season, which is up 4.1 percent from last year. • Rising retail sales. In 2018, retail sales are up nearly six percent over 2017, a trend that will hopefully increase as we hit the holiday season. • The combination of in-store and online shopping is better than ever before, giving consumers maximum convenience and endless options for shopping. • More shopping days! This year there are a full 33 shopping days on the calendar between Thanksgiving and Christmas—the most possible. These signs reflect a new way of thinking: It’s not a matter of if holiday shoppers will turn out this season, but where they will shop when they do. All of this leads to one big question: Is your brand ready to stand out from the crowd and capitalize on this significant opportunity? If you don’t know (or have doubts), here are four proven best practices you can implement to differentiate your email messaging, create and drive urgency, and engage with consumers on a one-to-one basis this holiday season. If you’re an omnichannel retailer with physical stores, consider using dynamic maps to help your shoppers find the one closest to them. 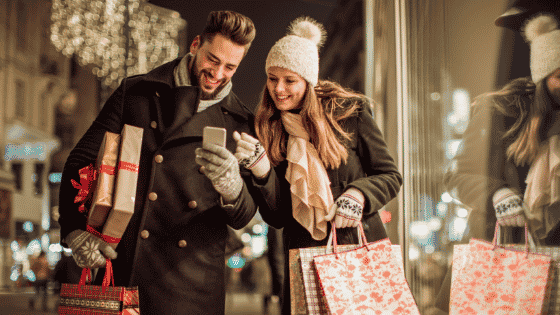 This can be an important advantage: research shows that in-store shopping is responsible for 79 percent of total holiday sales, and dynamic maps can help make it easy to get shoppers in your store. For example, PierOne, an omnichannel retailer specializing in imported home furnishings and decor, developed campaigns that included a dynamic map highlighting the closest retail store. The emails used geotargeting with the recipient’s zip code to offer an engaging—and helpful—email experience. When shoppers gravitate to online sites to look for gifts and purchases, this is the perfect time to serve an in-email poll. For example, you could ask “Who are you shopping for?” and directly link the responder to a curated product list that matches their selection. Glass half full: 33 shopping days between Thanksgiving and Christmas means more time to shop! Glass half empty: At the same time, it’s also much more time to procrastinate. Do all you can to stay top of mind with your shoppers by using add-to-calendar functionality in your emails. This lets people choose to set a reminder (or view reminders) related to expiring promotional offers or shipping deadlines in order to get their gifts in time for Christmas. Include a unique promotion code in the event’s description as an added bonus for those who choose to add an event to their calendar. This capability shows your audience that you want to help while also creating a sense of urgency that leads to sales. If you are looking to differentiate your creative from all the other messages in a consumer’s inbox, use kinetic mouseover functionality to show different product angles, features or colors. This interactive design allows the consumer to hover over your images to uncover alternate images. Consider showing an image of a wrapped present that unwraps or an advent calendar that shows the hidden “gift” upon mouseover—your creative will be interactive and festive, a win win! ‘Tis the Season … to Stand Out! This year’s holiday season looks to be big, and the market is ready to reward those retailers who can truly stand apart from the competition and capture consumers’ attention in new ways. Make sure you’re doing all you can to deliver the best experiences possible to engage, even delight your customers. Not only will they appreciate this personalized email marketing approach, but they’ll give you a gift in exchange: increased conversions, sales, and revenues. And that’s a gift any marketer would love to receive this holiday season.